This rare book was written by Fred Stenson in 1994. It is 144 pages of fiction called "Teeth." 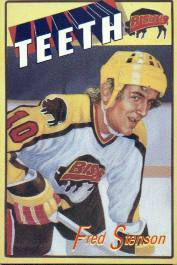 "Teeth" is collection of humorous short stories centered around Dougie Burns, a high scoring forward with the NHL Bisons. Losing a tooth in a bench clearing brawl sets Burns on a course that leads to an odd encounter with a dentist and his assistants, his marriage, a stint as a television commentator, and finally coming to terms with his hero Guy LaFleur. I am not sure about the success of this particular book, but I suspect Mr. Stenson has found more success in recent years. His 2000 novel The Trade was shortlisted for Canada's Giller Prize. His 2008 novel The Great Karoo was nominated for the 2008 Governor General's Literary Award in Fiction and is a nominee for the 2009 Commonwealth Writers Prize for Best Book.